Have you, by chance, been learning to read and write the Cherokee syllabary? Tahlequah might be the one place on earth where you can put it well into practice, as you can see from these opening pictures. The photo above tells you this is the Council House building. "The City of Tahlequah is the oldest municipality in the state of Oklahoma and was founded more than half a century before Indian Territory gained statehood in 1907. Tahlequah was founded as the national capital by the Cherokees who came over the Trail of Tears in 1839. In 1843 the Cherokee National Council designated the 160 acres surrounding their capital site as the township of Tahlequah and ordered it surveyed. The Original Townsite Historic District, lying west of the city's downtown, was the residential section of that first 160 acre town site." Tahlequah, as the seat of Cherokee government, has quite a few current and historic governmental buildings. One of those historic buildings is the Cherokee National Capitol built in 1867 [shown here on the right]. Donna and I have made two short visits to Tahlequah. April 25, 2001 we rode over from Arkansas, for just the day, with our friends John and Peggy. In 2004 we joined John and Peggy going to a powwow in Tahlequah. We drove our own car though, since we were heading back home from there, and we stayed an extra day. This picture was taken December 12. As the Cherokee national capital, another item you see around Tahlequah is the Cherokee Nation Seal. "The Cherokee Seal was adopted in 1871 by Act of the Cherokee National Council. The seven pointed star in the center symbolizes the seven Cherokee clans and the sacred number seven. Oak leaves around the star symbolize the sacred, eternal fire made from oak. The authority of the seal is written in English and Cherokee. The syllabary words are Tsa-la-gi-yi A-ye-hli, 'The Cherokee Nation.' The date, September 6, 1839 is the date of the adoption of the constitution of the Cherokee Nation West" [i.e. after the Trail of Tears]. On our December 2004 visit, Donna and I went for a walk around town. At one point, we wandered along the creek (or river) which skirts the edge of Northeastern State University. Like many college campuses, it is a very pleasant area to stroll. The University has a Cherokee heritage. When the original Cherokee Female Seminary burned to the ground Easter Sunday 1887, the Cherokee Council chose to rebuild the school on this 40-acre site north of Tahlequah. "Two years later, on May 7, 1889, the dedication ceremonies were held in honor of the new building. The Female Seminary was owned and operated by the Cherokee Nation until March 6, 1909 when the State Legislature of Oklahoma passed an act providing for the creation and location of Northeastern State Normal School at Tahlequah, Oklahoma, and for the purchase from the Cherokee Tribal Government of the building, land, and equipment of the Cherokee Female Seminary." I have set up an additional page showing more about the Cherokee Seminaries. The original Cherokee Female Seminary mentioned was located where the Cherokee Heritage Center is now. The Heritage Center was my main reason for wanting to revisit Tahlequah in 2004. We had spent a little time there in 2001, but I wanted to have longer to absorb the information, settings, and to take photographs. Plus, they had been working on a new exhibit when we visited in 2001, and I wanted to see how it turned out. My wife, knowing well how time can drag for those with me when I am serious about taking pictures, decided to drop me off and go shopping. "The Cherokee Heritage Center is a non-profit historical society and museum campus that seeks to preserve the historical and cultural artifacts, language, and traditional crafts of the Cherokee Nation in Oklahoma. The Heritage center also hosts the central genealogy database and genealogy research center for the Cherokee People. It is a unit of the Cherokee National Historical Society and is sponsored by the Cherokee Nation and other area tribes." Primarily, it has four distinct areas on its grounds, the outdoor drama (which did not have shows on the dates we visited), the Ancient Village (prior to European contact), Adams Corner (1800s), and the museum. I have set up a page for each of these last three. Come with me, and we will take a look together, at each one. You may click on a photo below, or here on enter, and we will simply take them in order. On our first visit to Tahlequah in 2001, we also visited the Murrell Home and the Ross Cemetery. They are both located in Park Hill, which is a separate Zip Code (74451). "The first post office was established at Park Hill May 18, 1838, with Samuel Newton as postmaster. In 1847, the post office was moved to Tahlequah. The post office at Park Hill was re-established April 22, 1892. 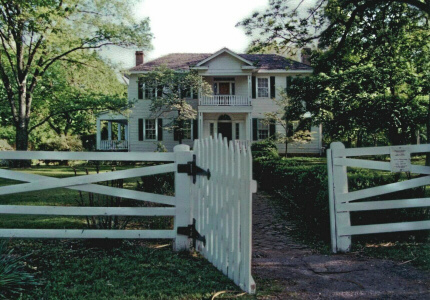 George Michael Murrell built his wife an antebellum plantation home in 1845 in Park Hill. They called it 'Hunter's Home' after George's fondness for fox hunting." For more about their Cherokee connection and additional photos click enter or on the photo. To close out this page I will share a few more photos from around the Capital Square area. There are many plaques and stone engravings around Capital Square. The elected (both east and later west) Principal Chief of the Cherokee Nation during the Trail of Tears and beyond was John Ross (shown at right). (below) "The surest safeguard for the government of the nation must be found in the respect and confidence of the people, and these can be secured only by its affording that protection to life and property for which it was instituted." It is interesting how many changes and uses our buildings and structures see over time, like the Cherokee Nation Supreme Court Building (above left). It "is the oldest public building in Indian territory, now Oklahoma. The building was erected in 1844 to house the Cherokee Supreme Court and the Tahlequah District Court. From 1870 to 1905 it was used as printing office for the Cherokee Advocate, the official newspaper of the Cherokee Nation. The building was severely damaged by a fire, in 1875, which destroyed the newspaper offices and printing press, and was later restored to its present condition. Following statehood in 1907, the building was purchased by the Cherokee County government for use as offices of the county Election Board and Superintendent of Schools. Ownership of the building was transferred back to the tribe in 1979." 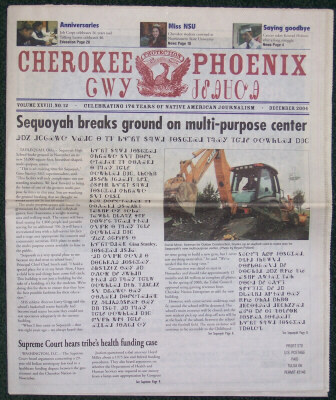 The Cherokee Phoenix was the first Cherokee newspaper. It was published weekly at New Echota (see the New Echota scrapbook photo pages) from 1828 - 1834 prior to removal. The Cherokee Advocate mentioned above and below appears to have replaced it for a while. But, when we visited Tahlequah, we were able to pick up a current copy of the Cherokee Phoenix, whose banner reads "celebrating 176 years of Native American journalism." One of the things I want to continue to highlight is the incredible acculturation dynamic of our Cherokee history. As you look at the images in these pages of people and buildings in the 1800s, keep in mind, this was not a bunch of uncivilized savages, as some school and history books might lead you to believe, who were so harshly impacted by the Indian Removal Act and ultimately the Trail of Tears. It is important to remember this. If we want to learn, and grow, through our American history and our past injustices, we need to be ever vigilant about truth. Text shown in quotation marks throughout these pages comes from various brochures, pamphlets, information sheets, other items picked up on our visit, Cherokee Heritage Center assistance, and Internet searches. Find many sources in the links pages.